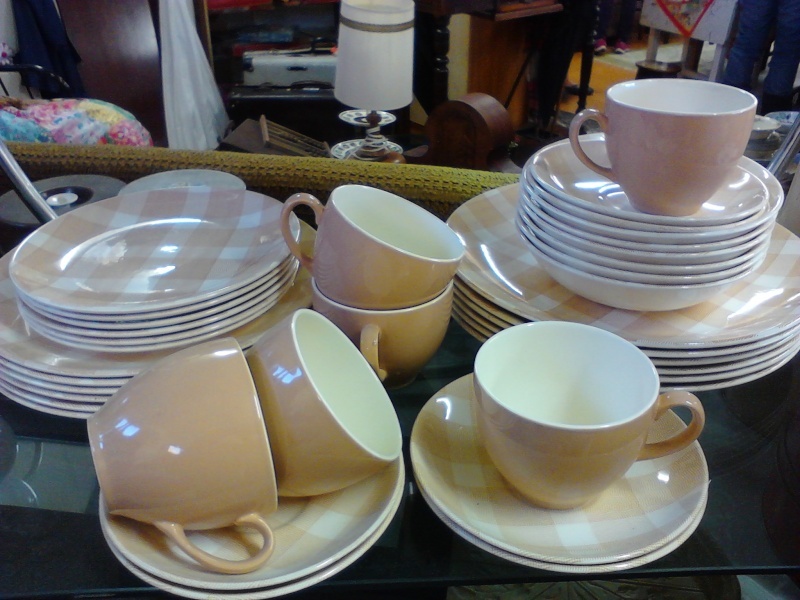 Came upon this pale apricot coloured gingham dinner set today. I hadn't seen Gingham in this colour before. The foreground of the photo make it look a bit cream but it was really pale apricot more like the cup upper right. Er...... I did, but the result is unprintable! I'm still getting to grips with taking photos with the cell phone. I thought I'd taken my camera but when I went to get it I had left it at home so the mobile had to do. If you live anywhere near Christchurch you may be able to get it. Send me a PM if you are interested. I still covet this set pictured above. My first ever Gingham is in this Apricot colourway and with the matching fatbottomed cup. I've just added to my Ginghams today with the help of a fellow enthusiast. The database shows Gingham Pat.No.505 in Pink, Orange, Black and Olive Green. Now I'm wondering if your lot are the same pattern, as you have heaps of other colours...? 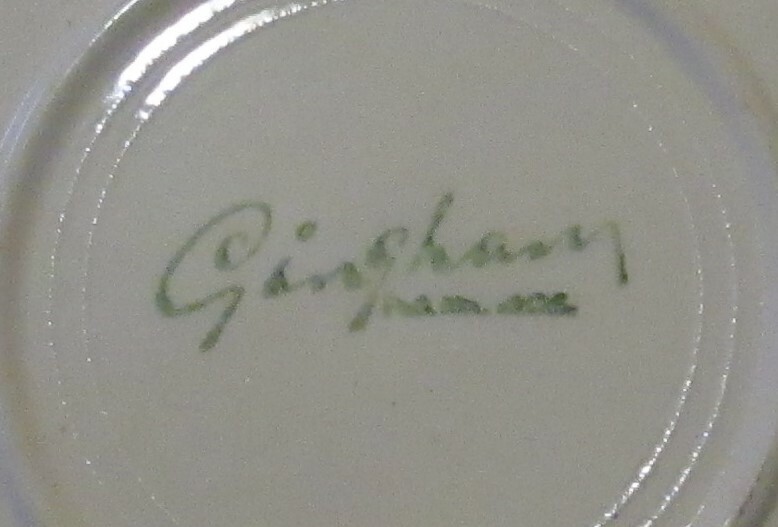 The backstamps should solve the problem they say "Gingham"! Def Pat 405 on the reverse of my Pink B&B the stamp is smudged on the Teal. 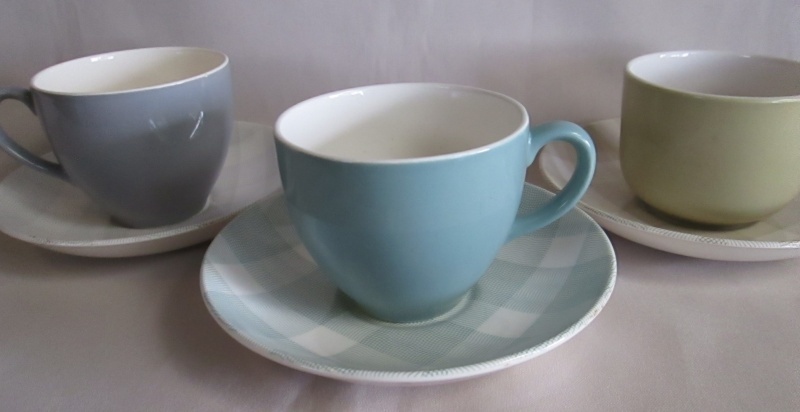 Saucers just say Gingham which is sweet. Can 100% say I have Olive, Black, Teal, Pink, Apricot (Salmon) I will try and get a clearer picture of that back stamp so you can have certainty. Those are gawjus, I've never seen that many colours in the checked pattern. Very similar I'd say the checked is a bolder pattern where as the gingham is "squiggly". Initial thoughts are that the checked is earlier again, then this older style gingham and then the later gingham??? Any thoughts? Yes I agree that the checked pattern is the oldest. There are several gingham patterns on the database and I will post them when I get home. These last 4 Patterns are all in the small check. Gingham Pat. 405 more colours.. I was lucky enough to find Gingham 405 this week, in Oyster, pale grey, Green & 2 shades of apricot. 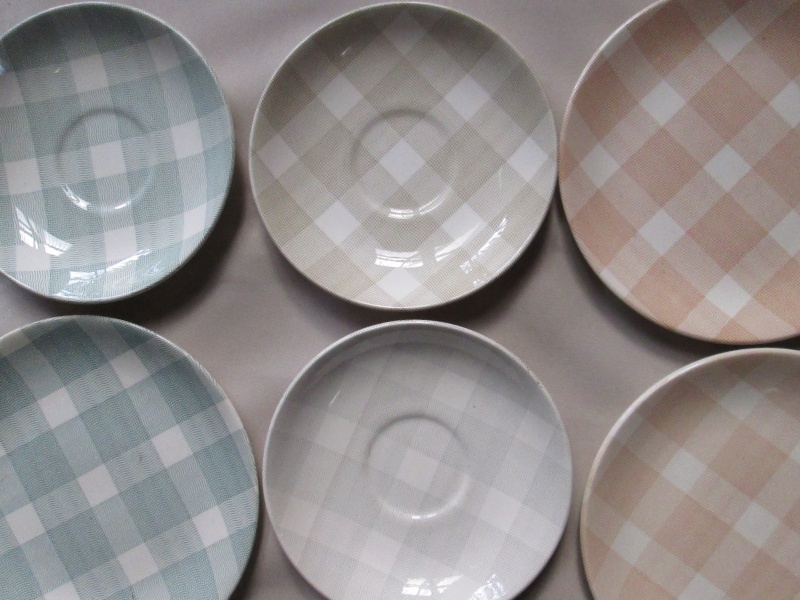 ..saucers have only Gingham Pat. 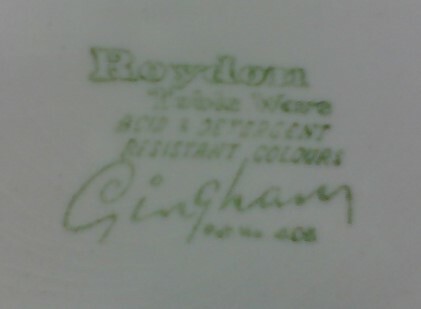 405 backstamp sides have bigger Roydon Table Ware etc stamp. Went to look for Sth Pacific shape cups to match my saucers & discovered that my greens really Teal & I need an oyster coloured fatbum.. 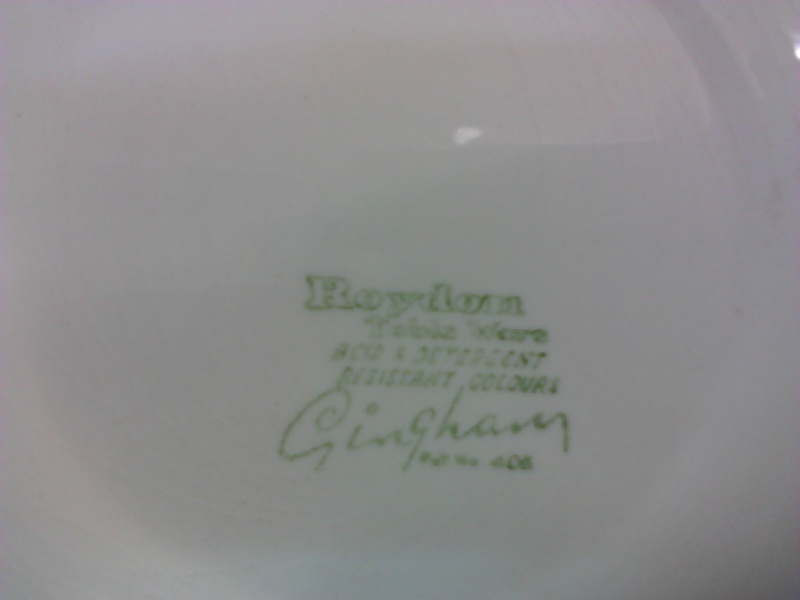 I will add Glenys backstamp pic as well, it is different to the other Roydon backstamps. Hard to read & no mention of NZ or British made..it reads..